[Ekawahyu Susilo]’s twist on the modular circuit kit, SnapBloks helps you create circuits by stacking components on top of each other with the help of three magnetic contacts that not only keep the modules stuck together but also deliver power, ground, and data to each part. [Ekawahyu] envisioned it as a prototyping kit, used to whip together an idea without a lot of hassle. It could also be an educational aid, used to teach Arduino coding while skipping the confusing tangle of wiring. You can stack a sound module on top of a power module to make a buzzer, or attach power to a wheel Blok to make a robot. With version 2 of the project [Ekawahyu] updated the look with color-coded shells, with pink signifying input Bloks, green for output, orange for communication, and blue for power. Each Blok has a Arduino chip inside — an STM32, which Hackaday reviewed back in March. For version three, he hopes to leverage the ESP8266 to make a WiFi-enabled Blok. [Ekawahyu]’s idea of having a cheap SMD Arduino in every module seems like a smart way to simplify module creation—no “controller block” needed! Where’s the inline diagram from? Looks… Wrong? Vcc sourced from the power blocks N/C pin? That’s not the only issue: all the RX pins are connected together… where does data come from? BTW, an STM32 for every block is overkill. Looks like a multi node one wire UART setup. Nodes are mostly listening, aside from relatively infrequent transmissions, I guess with random hold off periods to avoid any sort of synchronous clashes? Not seeing anything about collision detection, but I guess the blocks are simple enough in function that it doesn’t matter too much! Overkill… just imagine the price tag. It’s such a shame to see something so advanced being dumbed down to the ground. It’s like making a slingshot out of two sniping rifles and some rubber bands. Oh well, not my project and not my problem. Power’s presumably sourced from + and -, and N/C isn’t connected. 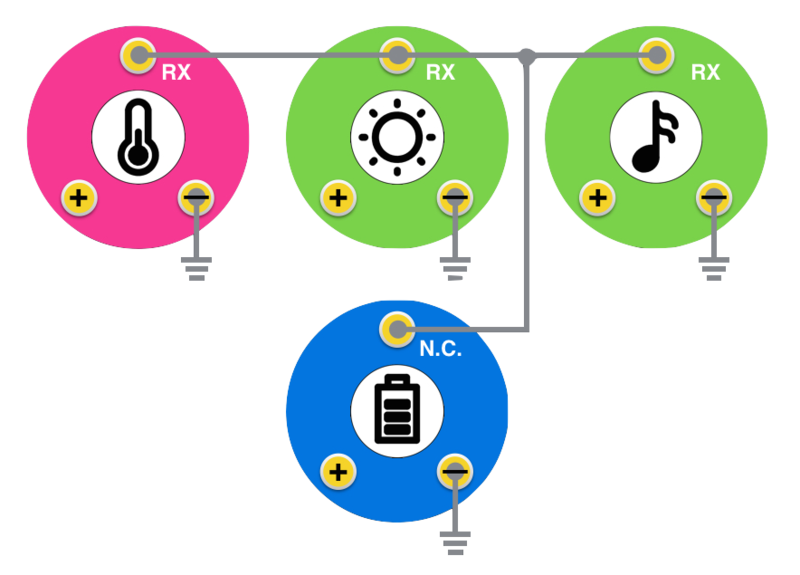 For some reason the + isn’t connected in the picture, and – connects to gnd, even though – IS gnd. STM32s are so cheap it might not be a bad idea, in this context, to do it that way. I still think the system as a whole is a bad idea though. maybe i’m being a bit negative here, but what are the benefits of this compared with, say, breadboards and wires?? the ‘confusing tangle of wiring’ is only confusing when the circuits get quite complicated (and if the experimenter doesn’t want to make the wiring tidy). I can see these blocks not being very easy to work with when you start getting to those kind of circuits. Or… how about the fact that it already exists? Who would have guessed that tom hanks makes educational electronics kits? The difficult stuff in electronics isn’t “how to connect components together”, it’s knowing what does what, and how to make a system out of it. Simplifying it all down to a serial bus for data isn’t a terrible idea, which is why there are so many systems out there that already do it. Adafruit has at least a couple, and there’s a dozen others out there. But really there are so many modern components that already have serial digital data. Arduino has ADC and PWM for the rest, what else do you need that this thing gives you? This is a solved problem, the answer was breadboard. Doing things this way would give a student, say, a very limited understanding of what they’re doing, with no real knowledge for doing electronics outside of this system. It makes things “easy” that are already pretty easy. If you can’t get the hang of Vcc, Gnd, and signals, then electronics is not for you. how do the magnetic contacts work? i’ve been wanting some sort of magnetic connector for my project. It’s supposed to be super modular. Are these compatible with Elenco’s Snap Circuits? This doesn’t seem so new to me. Snap Circuits(tm) and Little Bits(tm) have been around a long time. I suspect there are others. I remember somebody with a prototype of something like this at a Parallax conference, I believe they said they were looking for investors. The problems I see with these sorts of things are that once you get past the simplest of circuits you end up with a “black box” module that doesn’t really teach much. (Snap Circuits music module anyone?) Or… everything is really super expensive, to the point where you wouldn’t consider buying them for a kid until well after they are old enough to just solder it themselves (hello “Little Bits”). Imagine giving a kid $100 and telling them to do something cool with Little Bits vs telling them to use the same $100 to buy modules off of Deal Extreme or even Ebay. Then just spend a day actually being a dad (or mom) and help them to wire them together. There just is no comparison!